For three weeks beginning in mid-December, birders across the U.S., and in fact in many other areas of the world, bundle up to go count birds as part of the annual Christmas Bird Count. This year is the 110th Christmas Bird Count, an impressive record for an effort that is nearly all volunteer. In fact, this year, tens of thousands of volunteers are expected to help. 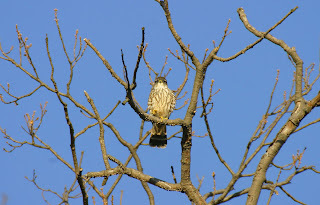 Ely had its Christmas Bird Count (CBC) on December 15, with some notable bird sightings including a merlin at the KOA and a wood duck at the duck pond near the library. I'm going to start taking a closer look at that duck pond! This was the first CBC in Ely. South Snake Valley had its CBC on December 17. 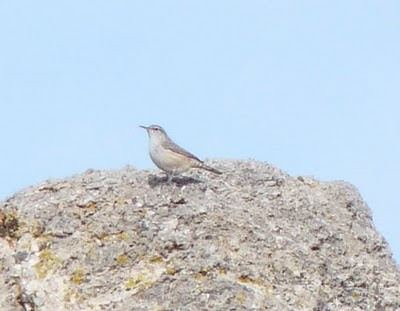 It looks like 46 different bird species were found, including a yellow-shafted flicker (most are red-shafted in this area) and a rock wren, pictured above and below. There's still one more CBC in the Snake Valley area, at Fish Springs National Wildlife Refuge. It will be held Sunday, January 3, beginning at 9:30 A.M. (Utah time). Anyone interested is asked to register ahead of time by emailing Jay_Banta@fws.gov. 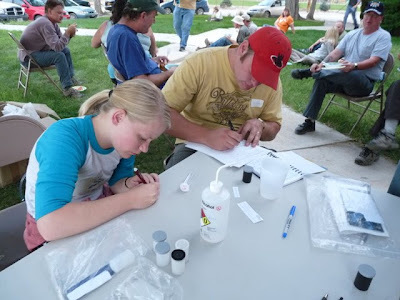 This CBC gets some top-notch birders from Utah attending, so it's a great opportunity to learn a few more birds at the desert oasis. I remember my first CBC, which was in Snake Valley. I wondered how in the world I was going to keep from being totally bored looking at birds all day, as I didn't think we would see that many in the middle of winter. I was wrong--when you concentrate on birds, you see them everywhere, even in the middle of winter! Now I really look forward to the annual Christmas Bird Count. 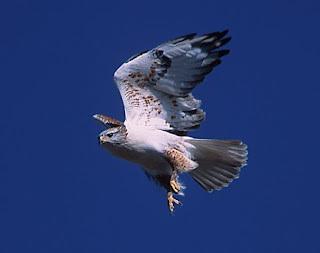 For more info about bird watching, scroll down to see the post by Jay Banta about Christmas Bird Counts and how birders stimulate the economy. 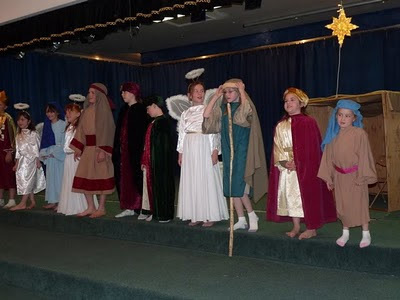 On December 24 at 7 pm (Utah), EskDale will hold their annual Candlelight Service and Nativity Play. All are welcome, and a dessert potluck follows it. 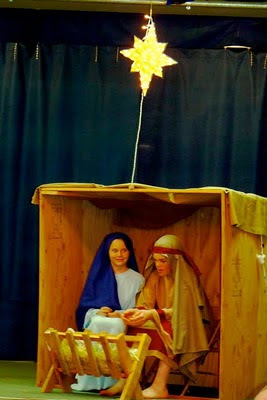 Here are a few scenes from the dress rehearsal for the Nativity Play. Local children are the actors, and they love getting dressed up. There are several musical numbers, and in EskDale fashion, are performed well with great accompaniment. Mary and Joseph had fun in the stable picking straw out of the manger. Baby Jesus will be played by a doll. 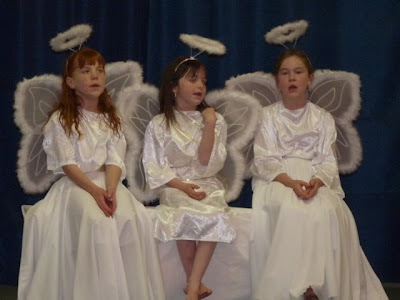 The angels were darling in their outfits and fun to watch as they got a little antsy from time to time. The cast of characters ends the program with Joy to the World. Tomorrow night there will be a couple more additions to the cast--they were napping during the dress rehearsal today. 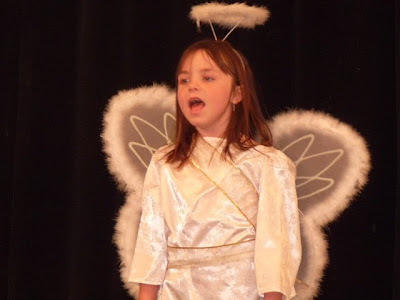 The play is never complete without a few hiccups, like straying sheep or costume adjustments. If you're looking for a great way to spend Christmas Eve, this is a fun outing. 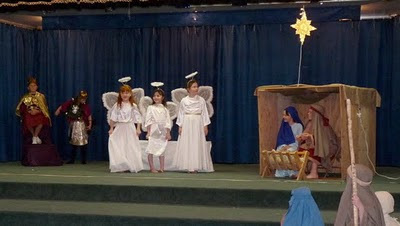 Last night the Baker/Garrison schools put on their annual Christmas program. It is one of the best-attended programs of the year, with Baker Hall packed. 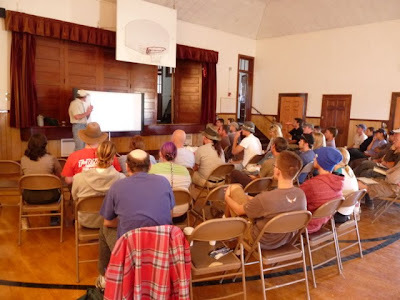 There were easily over 150 people in attendance. The program started off with the elementary school strings (four violins) doing two numbers, and then the band (a flute, clarinet, two trumpets, and a trombone) doing two more musical pieces. They all sounded quite good, especially for being fifth and sixth graders. Next the kindergarten-second graders sang, played recorders, and then did their play. 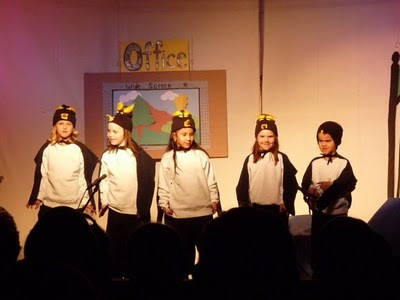 The play focused on a group of penguins trying to find a new home when their zoo was shut down. They flew to the North Pole, didn't get along with the polar bears, and then went to the Antarctic, where they decided to stay. It was really cute. 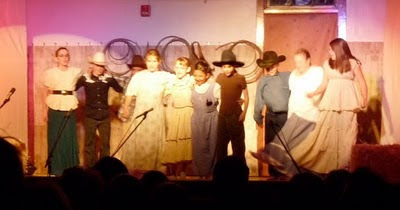 The third-sixth graders put on a well-rehearsed performance with lots of choreography and singing. Their setting was Christmas in the West, and it was obvious they enjoyed their costumes. The microphones from EskDale made a huge difference, as we were able to hear everyone well. 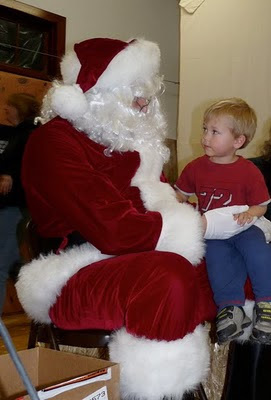 Following the program it was time for cookies and Santa Claus! A line of kids waited to tell Santa Claus what they wanted for Christmas. My son's wish: "presents." He should be satisfied! It was a nice evening and always good to see so many people from the community attending. The Baker Community Center is now open every week for anyone who would like to get together and enjoy the company of others in Snake Valley. It's open every Tuesday from 10 AM-2 PM (Nevada time). Sometimes there are special activities planned, such as the first Tuesday of every month is a potluck lunch and Bingo. The building is handicapped accessible and sports some great ironwork. Signs at the post office and the community center have the latest information. The community center has a library and magazine collection, and people are welcome to trade books and magazines. It's a nice destination, especially in the winter when you might be tired of looking at the inside of your own house! All ages are welcome. Carol Ferguson is the main person behind reopening the community center. She's ready to see more people attend and is willing to listen to ideas for different activities. Stop by on a Tuesday and check it out! I am thankful for the wonderful people, who despite living so many different lifestyles and from so many different backgrounds manage to come together for the important things. I am thankful for the excellent air quality that gives us fantastic views and better health. I am thankful for the clear night skies that make it possible to see our place in the huge Universe. I am thankful for having modern conveniences that we now take for granted: automobiles, Internet, telephones, paved roads (at least a few! ), and many time-saving appliances. I am thankful for the volunteers who help make our communities safer--the firefighters, EMTs, and others. I am thankful for our teachers and good schools so that the kids in the valley can have an excellent education and go on to whatever they dream. I am thankful for having some local businesses so when I really don't want to cook I can go out to eat. And I can fill up my gas tank without having to haul extra gas from town. And friends and family have a place to stay when they come and visit. I am thankful for finding this unique place in the world. I hope it doesn't change much. 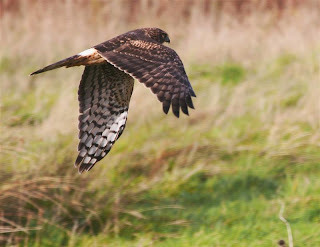 The time of year for the many Audubon Christmas Bird Counts is fast approaching. The Ely count will be on Dec. 15th, the Snake Valley count will be on Dec. 17th and the Fish Springs count will be on January 3. I hope you will consider joining in one or more of these counts for a good time, great camaraderie and a good opportunity to learn about our wintering birds. 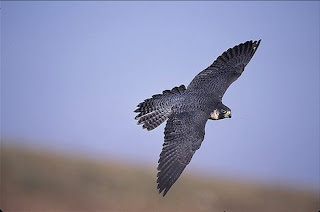 Absolutely no birding expertise is required, only a interest in learning more about birds! 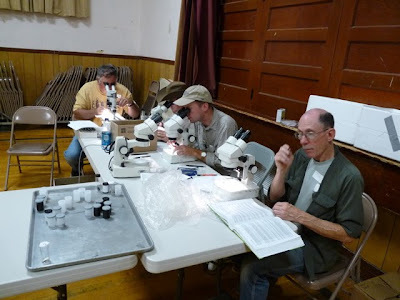 These counts are a critical citizen contribution to monitoring our wintering bird populations and provide very significant species status and trend data at the continental level. 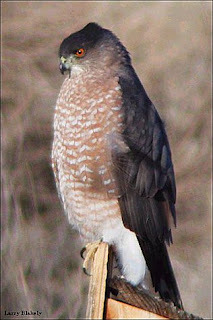 The coming of the various Christmas Bird Counts make a great segeway into the topic of wildlife watching and economics. 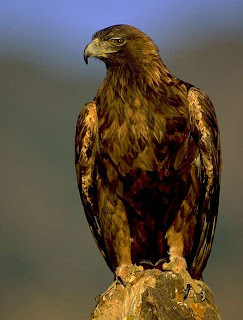 The simple fact is that watching birds and other wildlife is a very significant economic engine and most American are simply not aware of it. Every five years, the U.S. 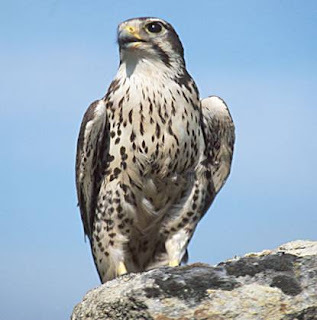 Fish and Wildlife Service conducts a national survey involving thousands of household that is called the National Survey of Hunting, Fishing, and Wildlife-Associated Recreation. The most recent survey was done in 2006 and I'd like to share some of the figures as they are a real eye opener for most folks who simply did not know that wildlife watching is such big business. I will be using the data from Utah but Nevada figures, factoring in population differences, will be commensurate. 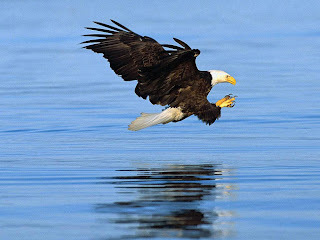 In Utah during 2006, and estimated 877,000 individuals engaged in wildlife watching. Of that group about 553,00o were resident and about 324,00 were non-residents. To give you a relative idea of the magnitude of wildlife watching, only 541,000 individuals engaged in hunting and fishing combined. Perhaps the most staggering figure is that the estimated expenditures by those engaged in wildlife watching in Utah in 2006 was a staggering 564 million dollars. An incredible 25.3 million days were spent in Utah wildlife watching around the home with another 2.2 million spent doing so away from home. 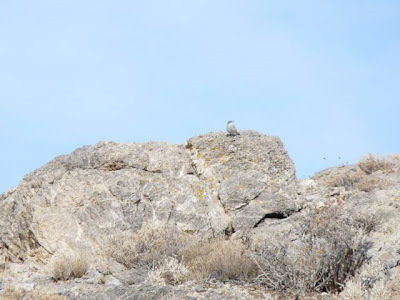 An even more indepth perspective on the tremendous economic and recreation activity that wildlife watching represents can be made by comparing these numbers to the Utah population in 2006. It was estimated that the population of Utah in 2006 was right around 2.5 million. So the simple math indicates that one 1 out of every 4.5 residents in Utah intentionally engaged in wildlife watching that year. 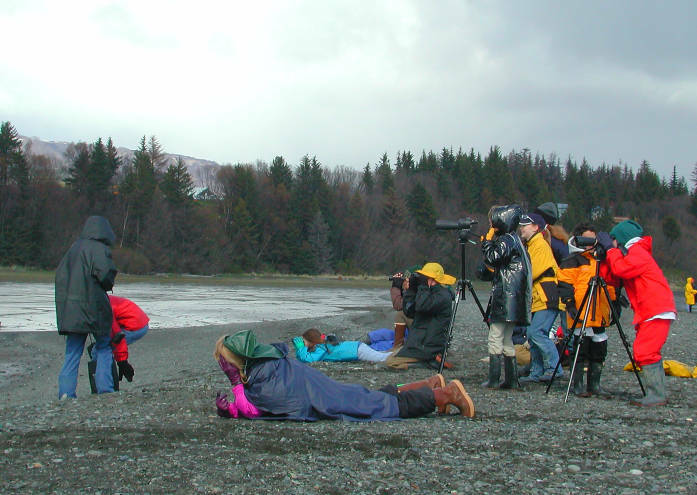 And remember that the average annual expenditure per resident engaged in wildlife watching was $214 per year! The 324,000 non-resident averaged and expenditure of $860 per year engaging in the same activity in the Beehive state! So the next time you see someone walking around with those tell tale binoculars on or, as is often the case with bird watchers, driving slow enough watching from the car that you would swear if they went any slower they would go in reverse, remember there are dollars involved here for our local economy. Give then an appreciative nod or even better yet, if you know a local hot spot for birds, take the time to direct them to it. 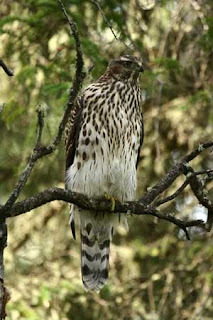 They will be very appreciative and will likely pass on to other birders that experience. Believe me, birders are on of the best networked groups I know of! 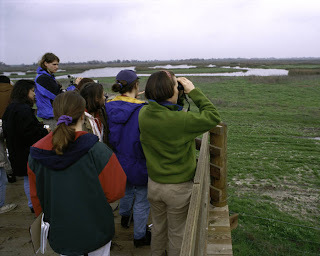 There are a number of places in the U.S. that have good birding but many fewer that have good birding and are famous for the hospitality that the "locals" show those visiting birders. I suspect the the latter just smile and appreciate that their economy is blessed by this infusion! This time of year is always a dismal time for me. Indian summer, my favorite season, has just passed and winter is around the corner. I hate to say goodbye to the flowers and plants that have given me so much pleasure during the summer. But this year is a little different. 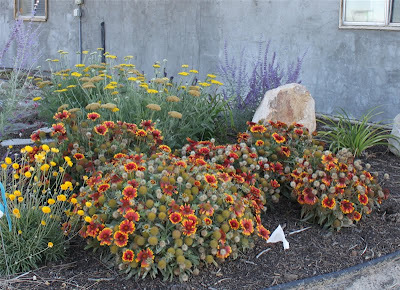 Last summer was a particularly inspiring gardening season for me because I've taken on the xeriscape challenge. 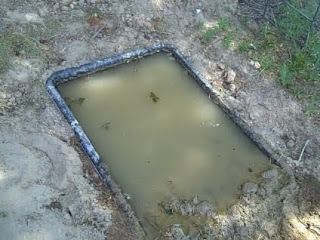 Fighting the water grab has made me a lot more conscious about my personal use of water. Water used to seem so plentiful here, but after seeing the results of our depleting aquifer, I have realized that water conservation is a personal responsibility, as well as community responsibility. And it's true for Snake Valley users as well as for Las Vegas users. 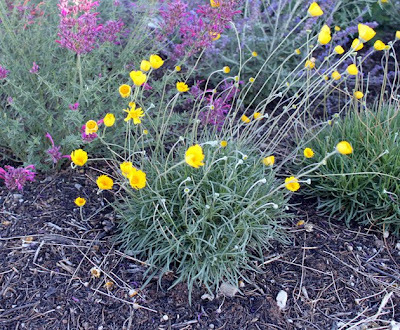 Although I've been intrigued with the concept of xeriscape which is growing plant species that are soil-and-water-friendly in dry environments, I haven't liked much of what I have seen. Landscaping with rocks and straggly plants just didn't inspire my green thumb. But after combing the Internet for ideas, I finally took the plunge, ripped out some lawn, and ordered dozens of plants from a nursery in New Mexico. I absolutely love the result! 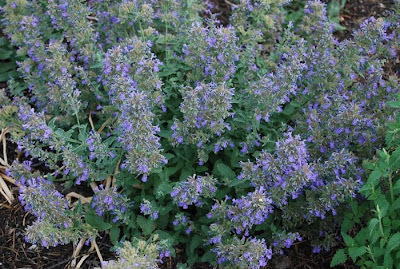 These plants have bloomed all summer and fall, only stopping after a really hard frost. They have wonderful fragrance - light and spicy, and attract hummingbirds and bees. As promised, they take very little water, tolerate the alkaline soil, and as an added bonus, tasty really nasty to rabbits and chipmunks! This is one of my favorite plants although it's not a particularly fragrant plant. It's called wild 4 o'clock. The flowers open up in the morning and evening, closing during the hottest part of the day. 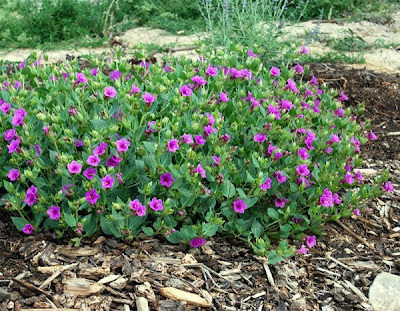 I only have 3 plants, but in the first season, they've covered an area of about 15 square feet, and are loaded with bright pink flowers. These gaillardia have been beautiful all summer, nicely mounded and covered with flowers. I don't know if I should have been picking the spent flowers. I still have a lot to learn about handling some of these plants and may be doing a lot of weeding next summer if they've produced as many seeds as I think they have. 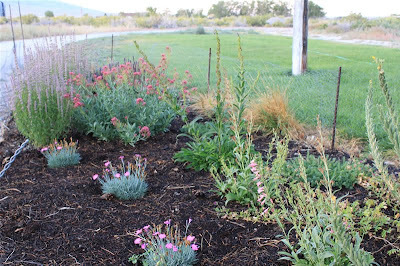 I even incorporated the mandatory dry stream bed that so many xeriscape gardens seem to have. 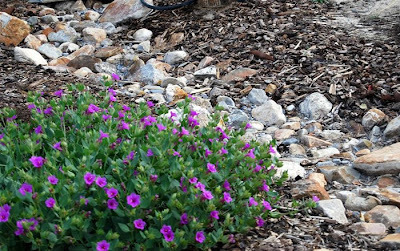 For a woodland look, I planted several varieties of penstemon. These were a little slower to take off, but by the end of the season, this part of the garden looked and smelled like the undergrowth in a pine forest. 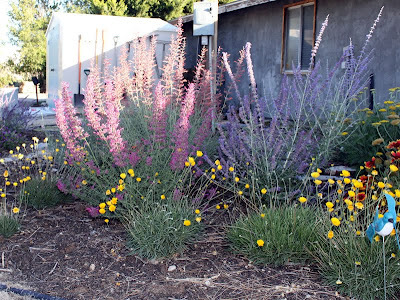 The nursery instructions said it would take up to three seasons for these plants to reach full maturity, but they were beautiful during the first season. So... for my first season of xeriscape gardening, I've avoided landscaping with rocks. The beauty and fragrance of these desert plants is simply amazing. I am more enthusiastic than ever. The cold winter months will be filled with dreams of new landscapes to conquer. Whether or not my small part in reducing the "water footprint" makes any difference in the larger scheme of things, I get a personal satisfaction knowing that I have a beautiful garden that is truly part of the desert I love. Over the last 160 or so years, there have been a number of intrepid and hearty pioneers who came to wrest a living from the West Desert. Some were associated with the various efforts like the Jackass Mail, the Pony Express, the Overland Stage, and the Lincoln Highway that sought to move mail, freight and people across a harsh environment. Others came to take advantage of the infrequent water sources to begin the first cattle and farming operations. They developed irrigation systems, grew hay, raised cattle and horses and were, for the most part, relatively self sufficient operations. 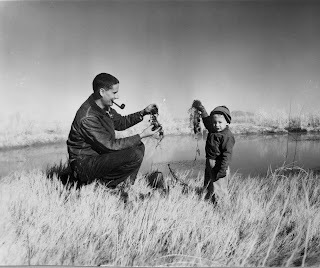 I like to introduce you to the first pioneers of the Fish Spring National Wildlife Refuge. 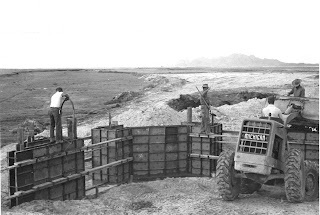 Arriving on the scene quite a bit later then many pioneers, in 1959 shortly after the Refuge was first established, Lynn and Judy Greenwalt, were, nonetheless, pioneers by any modern day standards. 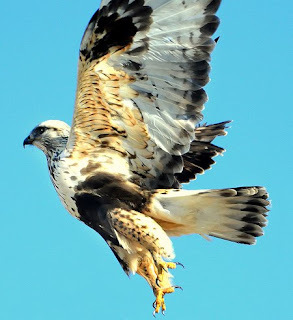 They would arrive at a location with great raw wildlife habitat, no housing other than a 20' trailer, no indoor plumbing or electricity and would leave it almost three years later as a thriving management refuge with houses, an office, dikes and water control structures being built and a generally a great deal more civilized then they had come to it! If Santa can find you at Fish Springs I guess he really does find all the children! 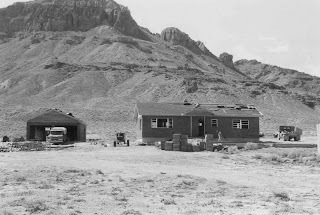 The entire Refuge HQ in 1960! 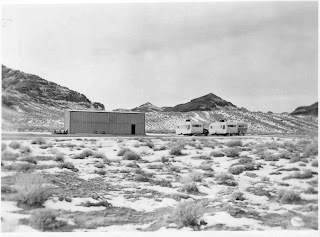 Mind you, the pair were well prepared for the trials and tribulation of being the first on site, living so far from civilization and enduring the lack of what most of us, even in the West Desert, now regard as normal amenities. They were prepared for this daunting task, you see, because both were the children of Refuge Managers. 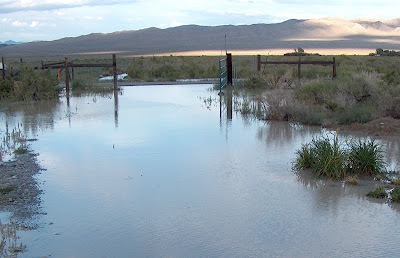 Lynn, in fact spent some of his youth at the Last Chance Ranch on the Sheldon National Wildlife Refuge in NW Nevada. Those who have been to that area know full well that it is still a pretty wide open and untamed piece of the world. 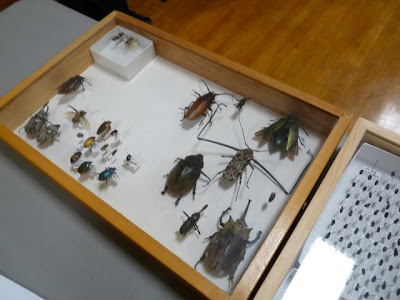 The two would meet when Lynn's father, Ernie would transfer to the Wichita Mountains National Wildlife Refuge in Oklahoma, where Judy's father was already on the staff. 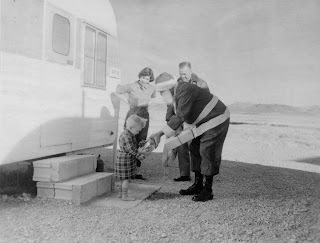 So in the fall of 1959, this intrepid pair, along with their four year old son Mark, would arrive at Fish Springs full of enthusiasm and with only a little bit of shell shock at the facilities that awaited them. Their home would be a vintage 20' travel trailer. An identical travel trailer would serve as the office while an old surplus military single airplane hanger would serve as the shop. They started off with a drilled well and a 1.5 KVA gas generator! After a few weeks they would advance to the luxurious level of a 7 KVA generator and, at least when the generator was running, a pressurised water system and even got a septic system complete with a cesspool! Mind you, that they could only run the generator three hours each day. Judy has related to me that during those three hours she would wash clothes like a mad woman, oftentimes to hang them out just in time for one of our famous west desert salt storms! 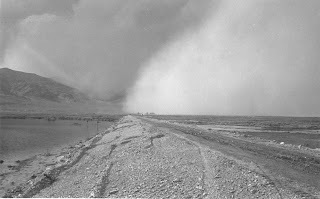 When those infamous salt storms did come in, the left a fine layer of dust over everything inside of the trailers! And not a vacuum cleaner in sight! The roads leading out of Fish Springs were, during those days, much poorer then what we know today. The Pony Express Road, at least that portion in Juab County, was particularly infamous. The sign below, posted at the county line in the early 60s when headed west on the Pony Express Road, pretty well sums up the situation! It is hard to read here but the top portion says "Juab County." The bottom piece reads "This Road Not Passable. It's Hardly Jackassable." Only the intrepid beyond this point! One of the ancestors of our "talcum powder" blowouts of today! 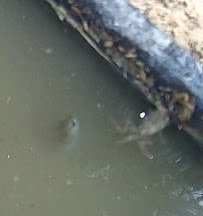 During Lynn's tenure, the Master Plan for the development of Fish Springs was completed under his guidance. 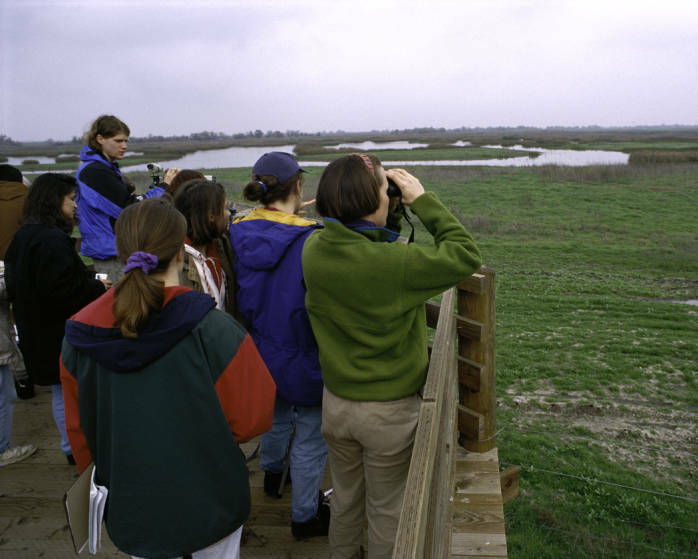 This plan would ultimately be the guiding force behind the vast array of dikes, pools, and buildings that have served the Refuge so very well for nearly 50 years. It is a real twist of irony, that after all of the efforts of planning and overseeing the construction of the first two Refuge residences (and believe me it was a contracting and oversight nightmare for him! ), the Greenwalts would only have the tremendous luxury of living in one of the new homes for a couple of months before the next assignment took them away. However, I'll bet after two years in a 20' trailer, those two months were absolute bliss for them! A great advancement in progress! Many thought that Lynn was insane for taking on this assignment initially but he would respond by telling them that "The Manager finds the opportunity to pioneer a new area stimulating and challenging -- and a not inconsiderable honor." 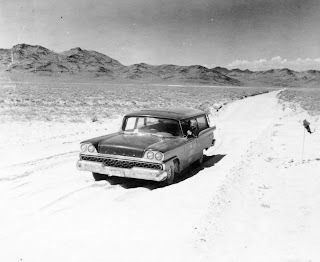 In 1963, Lynn and his family would leave Fish springs for an assignment in the Regional Office in Albuquerque, New Mexico. There would be other assignments to follow, culminating in his becoming Director of the Bureau of Sport Fisheries and Wildlife, the Department of Interior agency that would become U.S. Fish & Wildlife Service. He would lead the agency from 1973 to 1980. Refuge Manager here. 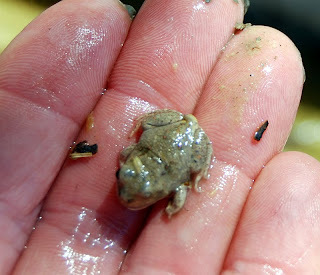 After nearly 50 years of having left Fish Springs and the west desert, it still possesses them. 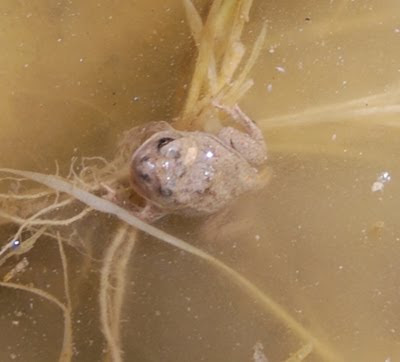 If you asked them of all the Refuges they grew up on and worked at, which is their favorite, they both still answer, without a trace of hesitation, "Fish Springs." It always makes me smile because I am among a very select few who really understand why.